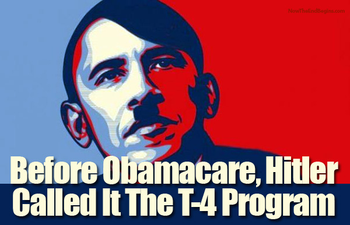 Obamacare's Resurrected Death Panels Modeled After Hitler's T4 Program Which Had 'Red List' Patients Slaughtered - Is This What's Coming To America? With the federal government's health-care program undergoing sweeping changes in 2016 as shared in the story excerpted below from Bob Unruh at WND, we take a look at the 'death panels' that have been 'resurrected' under the new Medicare rules as also shared in the 1st video below. 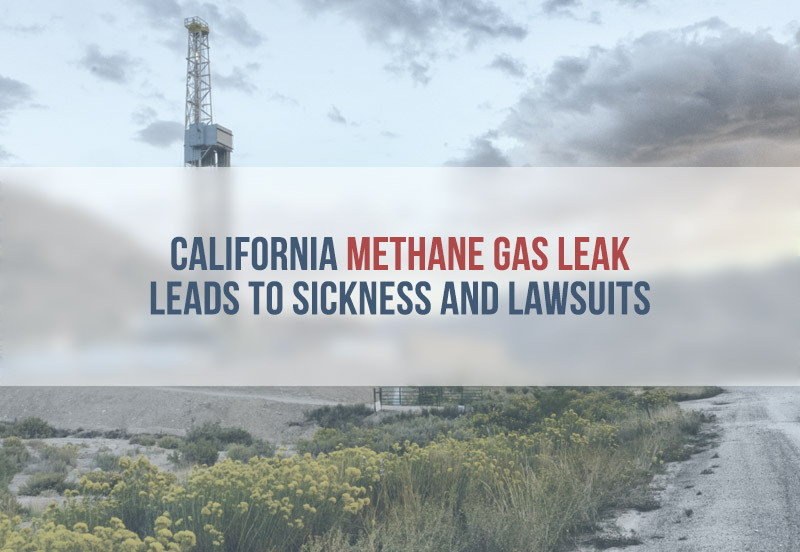 We also take a look at the latest health news Americans should be concerned about coming out of California as we learned today from ENENews that radioactive material is now blowing out of the Aliso Canyon, mixing in with the methane we can see spewing out daily and compounding an already troublesome situation. As our videographer shares with us in the 1st video, Barack Obama's 'death panels' are modeled after Adolf Hitler's T4 program which left a countless number dead - a program designed to eliminate 'life unworthy of life' as shared in much more detail below. While PolitiFact called Sarah Palin's 2009 assertion that Obamacare would contain 'death panels' the "lie of the year", we learn here that indeed 'the sick, the elderly and the disabled' will suffer the most under these newly resurrected rules that ring out as another huge part of the 'depopulation agenda'. We'll also take a look at the 'red marks' and 'blue marks' that Hitler's T4 program used to determine who was going to live and who was going to die as determined by medical experts in Nazi Germany and compare it to the 'red list' and 'blue list' here in America. Since Obama recently gave medical doctors the ability to determine if Americans should have the right to own guns or not, in direct contradiction to the 2nd Amendment and the US Constitution, we suddenly see medical doctors getting far too much power in their hands with the ability to play God... making decisions on who lives and who dies and who can protect themselves and their families. Just like in Nazi Germany. Much more below including the 2nd video which gives us the latest look at the methane leak at Porter Ranch while in the 3rd video, we get a factual look at Margaret Sanger, eugenics and the depopulation agenda. We also take a look below at all of the 'Nazi propaganda' that is now being thrown in our faces as we watch a possible '4th Reich' unfolding before our very eyes. As we can see, the depopulation agenda is in full swing in America and the 'elite' and the Obamacare 'death panels' may be getting some help in California as recently shared by ENENews where we learned that part of the content spewing from Aliso Canyon is radioactive. We're also told that 'a lot' has been detected in the area, it is extremely dangerous and it's likely coming right up into people's bedrooms, living rooms and homes. Robert F. Kennedy Jr., Jan 8, 2016: Their animals are dying… their fish are dying in their fish bowls, their dogs are dying, their cats are getting sick. And their children are getting sick — they’re suffering nose bleeds, they’re suffering terrible debilitating migraine headaches, asthma attacks, respiratory infections, eye infections, ear infections, stomach ailments… The health impact — it’s not just methane coming out of that hole… This is global crisis, more importantly this is a local crisis. Because not only do you have methane — you have benzene, toluene, xylene, which are carcinogenic. You have hydrogen sulfide, sulfur dioxide — which are neurotoxic, which can injure your brain, affect memory, injure your kidneys, your liver, your other bodily organs. There’s also a lot of radon gas being measured in the area. People believe — we don’t know if this is true — the gas that is leaking at 2 miles deep is now coming out and pushing that radon up into people’s living rooms, their bedrooms, their nurseries. 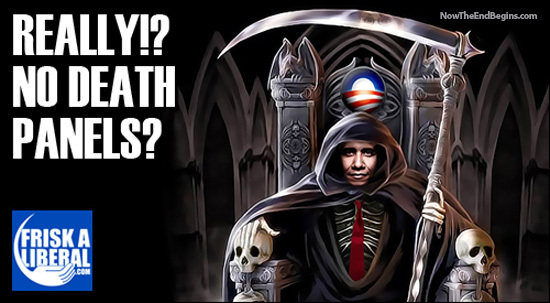 With all of the help that the 'elite depopulation agenda' is already getting, do we really want or need 'death panels' in America? Much of the news excerpted from the WND story below comes straight from the Associated Press. Is this another sign that clearly shows the direction that America is heading? 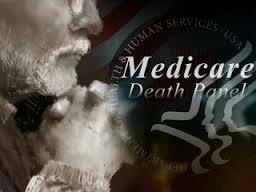 The AP said Medicare will pay clinicians to counsel patients about options for care at the end of life. 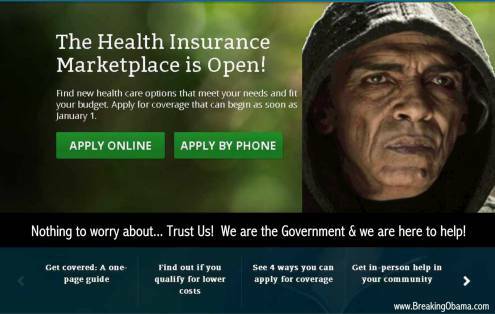 The report said the voluntary counseling would have been authorized earlier by Obamacare if not for the outcry prompted by Sarah Palin’s “death panel” charge. “Hastily dropped from the law, the personalized counseling has been rehabilitated through Medicare rules,” the report said. “Now for the first time ever the primary party for health care for seniors, Medicare, is going to be able to tell you what kind of care you can get, where and when you can get it and worst of all, when you’ve had enough,” he told WND. In 2010, about the time Obamacare was adopted, left-leaning New York Times economic columnist Paul Krugman said such “death panels” would end up saving “a lot of money” for the government. What was Hitler's T4 program? 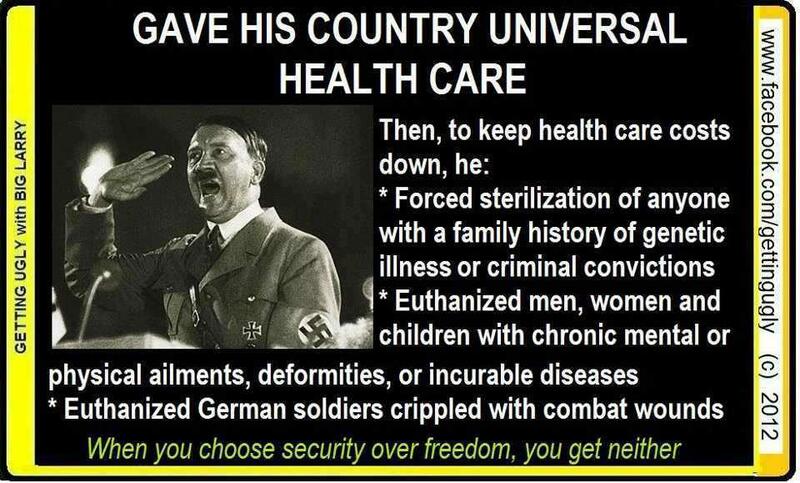 The History Place story excerpted below breaks down the Nazi's euthanasia program for us and in it we learn that the elderly, sick and disabled were among those who suffered the most under Hitler's healthcare program. We also learn here about the 'red marks' and 'blue marks' that were placed upon people by their medical doctors who determined if the people lived or died. Is this where they got the 'red list' and 'blue list' from? Are we witnessing the rise of the 4th Reich across the world with Nazi propaganda now being spread wide? Steve Quayle's new book 'Empire Beneath The Ice' looks at the truth about history that has been hidden for many decades now. In October of 1939 amid the turmoil of the outbreak of war Hitler ordered widespread "mercy killing" of the sick and disabled. Code named "Aktion T 4," the Nazi euthanasia program to eliminate "life unworthy of life" at first focused on newborns and very young children. Midwives and doctors were required to register children up to age three who showed symptoms of mental retardation, physical deformity, or other symptoms included on a questionnaire from the Reich Health Ministry. Each expert placed a + mark in red pencil or - mark in blue pencil under the term "treatment" on a special form. A red plus mark meant a decision to kill the child. A blue minus sign meant a decision against killing. Three plus symbols resulted in a euthanasia warrant being issued and the transfer of the child to a 'Children's Specialty Department' for death by injection or gradual starvation. The Nazi euthanasia program quickly expanded to include older disabled children and adults. Hitler's decree of October, 1939, typed on his personal stationary, enlarged "the authority of certain physicians to be designated by name in such manner that persons who, according to human judgment, are incurable can, upon a most careful diagnosis of their condition of sickness, be accorded a mercy death." Patients had to be reported if they suffered from schizophrenia, epilepsy, senile disorders, therapy resistant paralysis and syphilitic diseases, retardation, encephalitis, Huntington's chorea and other neurological conditions, also those who had been continuously in institutions for at least 5 years, or were criminally insane, or did not posses German citizenship or were not of German or related blood, including Jews, Negroes, and Gypsies.